When you have your carpets steam cleaned it usually takes a few hours to dry. On average it takes 5-6 hours to dry. It should not take days or more than 24 hours to dry. When a carpet cleaner is done cleaning your carpet should be damp not soaking wet. Carpet cleaners should be extracting as much water as possible from the carpet so you don’t have so much water remaining in the carpet. 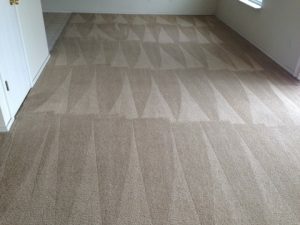 Carpet cleaning doesn’t mean you are left with wet carpet that could grow mold and mildew but means you are left with clean sanitized carpets. Some carpet cleaners offer products that will reduce your dry time. Beyer Carpet Cleaning offers quick dry or speed dry which reduces drying time from 5-6 hours to 2-3 hours after they have left. If you opt out of using a carpet cleaners quick dry method then you are stuck with waiting hours for your carpets to dry. So here are some must knows to make sure your carpet dries properly and without any issues. Rule #1 – This is the most important rule. Always ventilate the rooms that were cleaned. Leave on air conditioners, celling fans and/or stand alone fans. If you turn off the a/c or fans it’s like leave wet towels in a bag and closing it. Your carpets will smell like mildew if you don’t allow them to dry properly. This happens a lot when people are moving out of a rental. They will have the carpets cleaned but shut everything off without thinking about the wet carpet. They are enclosing this wet carpet allowing it to stink up the house. Not only will you blame the carpet cleaner when it wasn’t their fault but you may not get your deposit back. So ALWAYS make sure when you are carpet cleaning to have your home well ventilated to avoid smells, and growth of mold and mildew. Rule #2 – The faster your carpet dries the less risk there is of mold and mildew growing. The longer something is wet the higher the chances are for mold and mildew to appear. This is no different when it comes to carpet cleaning or upholstery cleaning. If mold and mildew grow you will have to get that treated or even have to replace the carpet or upholstery depending on how bad it is. Rule #3 – Always chose a professional carpet cleaner who isn’t going to soak your carpets. Beyer Carpet Cleaning leaves carpets damp never soaking wet. They are careful to extract as much water as possible. Most real professionals in the carpet cleaning business use truck mounted machines so they can extract properly. So when it comes to carpet cleaning remember to always ventilate your rooms and to leave the a/c and fans on so your carpet dries fast. The faster the carpet dries the less your chances are for mold and mildew. Always use a professional that can extract as much of the water being used to steam your carpets. So call Beyer Carpet Cleaning the professionals of proper carpet cleaning, tile and grout cleaning, and upholstery cleaning.